A seaplane landed in Lake Michigan on Monday, officials said. CHICAGO — A pilot landed a seaplane in Lake Michigan on Monday, worrying the Fire Department — until they realized the plane was perfectly safe. Larry Merritt, a Chicago Fire Department spokesman, was at a ceremony dedicating a Fire Department boat in honor of fallen firefighter Eugene Blackmon. The boat was launched into the lake so the Blackmon family and fire officials could have a ride, Merritt said. But that's when they received a call of a plane in the water. The boat headed toward the plane, Merritt said, but as they approached they saw it was calmly sitting in the water. A pilot, who said he was from a suburb to the north, told them he would been taking off in a few minutes and wasn't in distress. Merritt said the boat moved back and the crew watched as one of the plane's propellers kicked on and the other started spinning. Merritt took photos of the plane. "They started moving fast on the water and they just took off," Merritt said. "It was pretty cool, though." The chief of the boat told Merritt he had never seen that happen in 10 years, though the Fire Department noted on Twitter that planes don't need special permission to land in the lake. 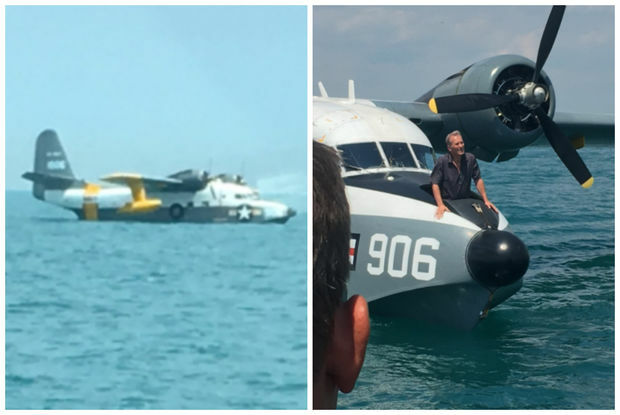 "They've never seen a seaplane in Lake Michigan," Merritt said. "It was our lucky day."